Situated within the paradise setting of popular Cayo Coco, the All-Inclusive 5 star hotel of Meliá Jardines del Rey welcomes you to explore its Wedding and Honeymoon programmes, for couples. The luxury and comfort of our hotel, combined with the outstanding beauty of its beach and the numerous bird species in the area make it the ideal destination for couples. Your Wedding at Meliá Cuba makes sense, especially if you are accompanied by a certain number of guests, in which case it will be totally free. 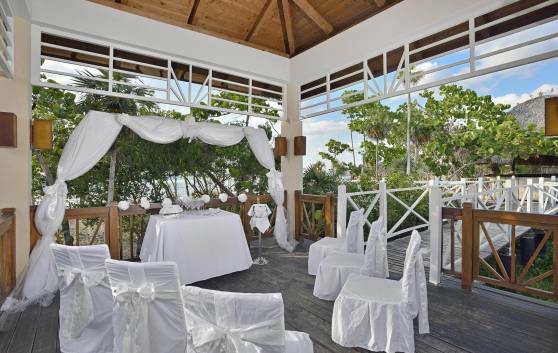 We would be thrilled to organize your wedding ceremony in any one of our Paradisus, Meliá or Sol hotels. You decide! Let Meliá Cuba guide you in organizing the wedding of your dreams. Meliá Cuba will take care of all the wedding details when you choose any of the Wedding packages specially designed for this occasion. Just tell us your dream and we’ll make it come true! Don’t miss the occasion to celebrate this beautiful moment in the company of family and friends in one of our enchanting city or beach hotels. Renew your vow of love with the excitement of unforgettable moments. Relive the emotions of your original wedding day. Attractive packages to make your stay in Cuba as romantic as it is memorable. We can offer you memories to last… a lifetime! Minimum Stay: 6 nights at a hotel from Meliá Cuba or a combination of them.